Oyre (soups of groats) : wheat, rice, buckwheat, avenaceous et cetera. Except groats, in soup it is possible to put a potato, bow, carrot and other vegetables then oyre will be more thick and saturated. Oyre cook in cast-iron, in a stove, but it is possible to cook and in an ordinary pan on a fire. When ojre prepares in cast-iron, all foods are mortgaged simultaneously and inundated by water. To this time to be stove must be melted, coals and ash it is necessary to rake out, cast-iron densely to close a lid and to put in a stove. In filtering meat-stock for preparation lay the well washed buckwheat groats, when will begin to boil, add the large cut potato and by groups carrot, onions warmed-up melted butter shredded by rings. To liking lay salt, pepper, at the end of cooking is a laurel sheet. Taken to readiness. At a serve the piece of meat is laid in every dish, buckwheat oyre is sprinkled with greenery. 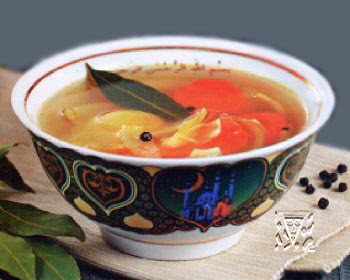 That soups, prepared with groats, did not become cloudy, groats can be boiled separately and in the end to connect with other foods. On one portion: meat by a bone-in - a 100 g, bulb onion - 20 g, carrot - 20 g, potato - 100 g, groats buckwheat - 60 g, oil melted - 10 g, salt, pepper, laurel sheet.